Wow, what a gorgeous day. I personally don’t roller blade. But I did take a good long walk today, dug out the gardening tools, and started the spring cleanup. Then before dinner, Jeff and I had a sit, with a glass of wine, on the front porch….first of 2010. Life is good. Yes, you do need a mosiac mailbox……..but make sure it’s chained to the post or someone elss may like it a lot and want it at their house. looks warmer there than here! We are still wearing sweatshirts and jackets!! 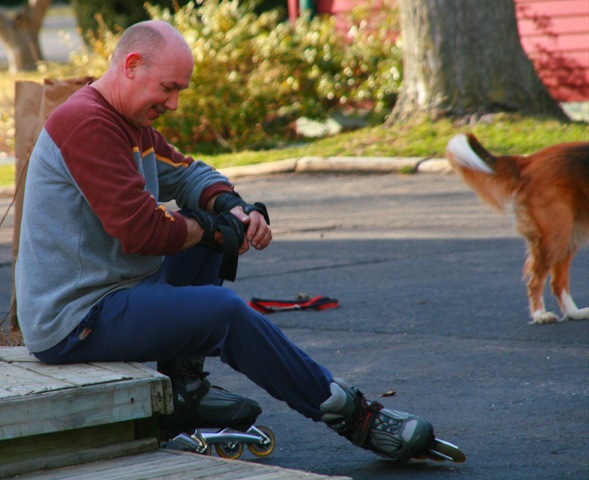 Me too….I tried rollerblading until the time my feet went flying out in front of me. That my kind of sprint too…as long as I don’t spill the wine on the way. Yeah, I’m a sprinter too. I run out to the yard, and sit on the patio. Marlo does the 1/4 mile dash with Jeff…and then is done, she’s a sprinter dog. I was serenaded by a strolling barefoot violinist granddaughter for 2 hours in my yard. My favorite day this year. It sure looked WONDERFUL out there, but I didn’t get out!